TRIDNet is the GUI version of TrID, probably more practical to use than the CLI version, especially for those not very familiar with the command line prompt. In addition, with a simple double click, it have the ability to display a series of information about every match listed: the definition's file name, its author & e-mail address (if provided), a clickable link to a reference URL, remarks, etc. At the moment TrIDNet is able to load only the filetype's definitions in XML format. 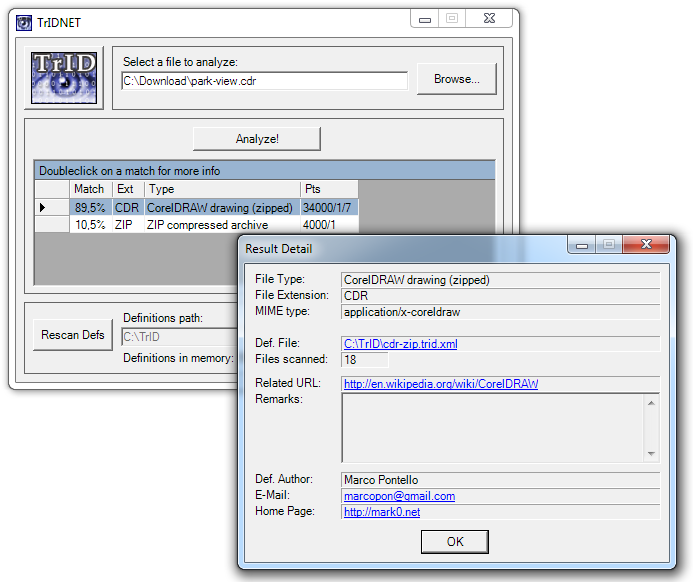 Soon, it will be updated to support also the new single file .TRD package. Anyway, it's sufficent to download the archive with the XML defs and unpack it into the same folder. There's nothing special to do for the installation and the registry isn't altered in any way. Upon start TrIDNet load all definitions at once from the file TrIDDefList.TRS. If that file doesn't exist, or a Rescan is requested, TrIDNet will in turn load all the defs one by one from the original XML files; once the loading and parsing is completed, the entire TrIDDefList.TRS file is (re)written. This way, next time TrIDNet is started it will load all the defs in an instant. When running TrIDNet, it's possible to specify the file to identify as a parameter. This way, TrIDNet can easily be integrated with various filemanagers, or even with Explorer itself. See forum for some examples. TrIDNet use the TrIDEngine as its "core", and can also be considered a demonstration of the features that the library can provide. The same is valid for the Online TrID. For any info or question, feel free to contact me or take a look in the forum! N.B. The .NET Framework is required. If TrID proved useful to you, maybe you can write a comment here in the forum! If you like TrID, you may consider a little donation! Even a couple of $ will let me know that you appreciate my work! Thanks! + Rebuilt targeting .NET 3.5, for better compatibility with older systems. + Added MIME Type support. + The file to analyze can be passed as a parameter. + Definitions Caching; vast speed improvement on first scan. * Fixed a bug searching for strings > 255 chars. + Unique strings search speedup. + Better handling of malformed XML definitions. * Fixed a minor bug that could lead to a crash on rare occasions. + Unique strings evaluation now is case insensitive. + Analysys engine enhanced. Now it can use some unique strings (if contained in the defs) in addition to binary patterns at fixed positions.